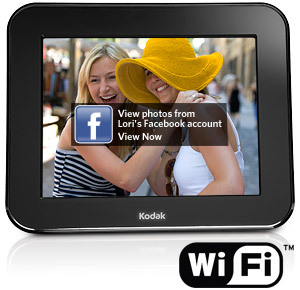 Kodak Pulse is a 7-Inch Digital Frame features 512 MB internal memory, memory card reader for easy viewing, 800×600 high-resolution picture display, 7 in. 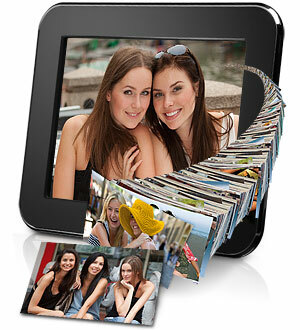 (17.8 cm) high-quality digital photo display; Wi-Fi enabled. This digital photo frame also supports 2 card slots and 1 USB port—Secure Digital (SD), Secure Digital High Capacity (SDHC), Multimedia Card (MMC), MEMORY STICK (MS), MS PRO/MS PRO DUO, XD-Picture Card (xD), USB Thumb Drives; Plays JPEG, EXIF. The Digital Photo Frame measures (W x H x D) 7.5 × 6.1 ×2.5 in and weighs frame and adapter: 18.2 oz. Refresh your world with endless pictures. The exciting way to get a steady stream of new pictures from everyone in your life. You know how good it feels to come home to find an unexpected gift from a friend? That’s the same excitement you get every day with the KODAK PULSE Digital Frame. Now everyone can send pictures right to your frame, giving you continuous surprises. Adding your own pictures is easy too. It doesn’t slow you down with time-consuming software setups or complicated technology. It makes connecting with friends and family simple, so you’ll always have new pictures to relive and enjoy. This entry was posted on Sunday, February 3rd, 2013 at 5:30 am and is filed under Digital Frames. You can follow any responses to this entry through the RSS 2.0 feed. You can skip to the end and leave a response. Pinging is currently not allowed.